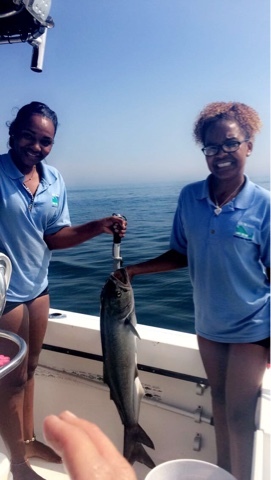 Sea, Sand & Sky: "Fishing Queen"
This past Thursday was by far the best day ever this summer. It was also one of my favorite days because it was the fishing tournament. 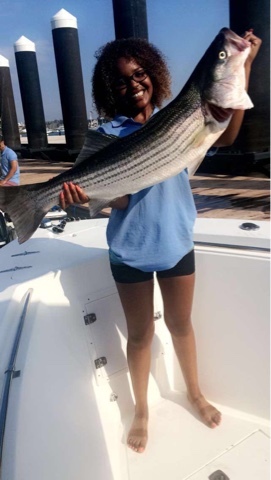 This year for the fishing tournament, I was known as the "fishing queen". I was also lucky enough to be on a fast boat with Sedny. We had the best captain whose name was Brian. Our boat did not have a name but Brian said we could call it "The Green Contendent". Before we were picked up, Brian had caught a 39 inches striped bass. Sedny and I became good friends with Brian so with that being said, the boat ride was extremely fun. We went fishing near Spectacle Island where we caught nothing after being there for about 15 minutes. After we decided to go cast somewhere else where there were blue fish. I never caught a blue fish so I had no idea what they looked like. Somehow I had a blue fish on my line and as I was reeling, I looked to my left and Sedny also had a fish on her line. This was a double header and as Brian watched us reeling in thr blue fish he was laughing because Sedny and I were just screaming like crazy. We reeled in for about 5 minutes because the fishes were really heavy and were putting up a good fight. A moment after, I decided to cast my own fishing rod and when I say I had a fish on the line right away, you guys would not believe me. This other blue fish was also putting up a good fight. I struggled to reel it in but I was happy to bring it in. As we were about to wrap up fishing, I had another blue fish on my rod and this time it was a bigger blue fish who also put another good fight and also had me talking all by myself. Thursday's fishing tournament was just my lucky day. I was able to catch 3 blue fishes. One was 31 inches, the other was 33 inches and the bigger one was 36 inches. When we got back from the tournament, I was getting all of the attention from my co-workers. A lot of the started saying that "Its insane how everytime I go fishing, I always end up catching something." They ask me how do I do It and I just do not know what to say. I am guessing my fishing skills are just getting better and better day by day. Lastly, I would like to thank my captain Brian and the other captains who volunteered to donate their boats. It was the best day of the summer and I had a blast.